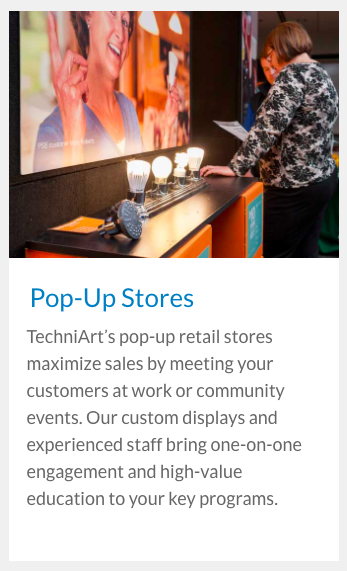 TechniArt has a great history of developing effective “pop-up” utility branded stores in places like malls, community events, corporate offices and anywhere else that people can be engaged with an energy efficiency message. Over the past few years, they have also developed online “pop-up” marketplaces that offer a limited time deal on a focused selection of products. Their impacts have been significant and utility programs often go to them because they are nimble and have the ability to produce significant impacts, quickly. TechniArt is now evolving their product offering by bringing commercial midstream programs online in partnership with Rebate Bus. Rebate Bus has commercial utility rebate programs in it’s DNA. The Rebate Bus platform is connected to the DLC and ENERGY STAR API’s and has over 17,000 unique rebates for commercial lighting programs that it can serve to partners like TechniArt. TechniArt is particularly interested in the mid-stream programs available in the market and working closely with utilities to create branded marketplaces that can serve their customers. The Rebate Bus API and checkout widget will handle customer verification and TechniArt will handle customer service, logistics, and marketing. If you would like to meet with TechniArt at this year’s AESP National Conference meeting each out to them at this link. February 19–22 at Booth 205.